WOW! Species Clematis otophora Blooming in My Garden! Last spring I purchased a healthy Clematis otophora, which is said to sport yellow bells, and planted it to grow on an Acer griseum (paperbark maple). I know very little about this plant, but it grew and grew. Even so, I never expected it to bloom in the first year (first six months, really). Just a couple of weeks ago I was thrilled to see buds (see photo), but I wasn’t sure whether they’d have time open before frost. Then on Saturday I found blooms — the most lovely yellow bells! See photo below. There seems to be very little information about this rare clematis from the mountains of Sichuan in China. I am hoping against hope that it is hardy here in the Pacific Northwest because it looks so happy, I simply can’t bear to move it. Clematis otophora was sold to me by Far Reaches Farm in Port Townsend, Washington. We here in the Northwest are fortunate to have this nursery because the enthusiastic proprieters, Kelly Dodson and Sue Milliken, are plant nerds extraordinaire and thoughtful plant explorers. In fact, they are on a plant exploration right now, in China, I believe. You can visit Far Reaches Farm online at: http://www.farreachesfarm.com . They offer many plants via mail order and have special open days for visiting the nursery. 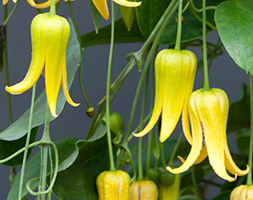 They specialize in unusual plants, including a few rare clematis. For example, this August when I visited the nursery in person, I was able to buy two additional unusual clematis, Clematis tibetana (the black form) and Clematis repens. These two plants are young yet and still in pots — I may get them in the ground next spring; if not, then next fall. If you happen know anything more about any of my three new unusual clematis (Clematis otophora, Clematis repens, or Clematis tibetana (black form)), please, please let me know!!! 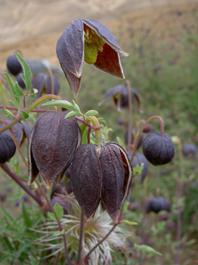 See below for photos of Clematis tibetana (black form) and Clematis repens. Hi Laura, nice to find out about your blog and congratulations on your speaking gig at next years Garden Show!